With the help of the West, members of the volunteer rescue force known as the White Helmets are fleeing Syria as Russian-backed forces gain ground. Both the United States and Russia hailed the evacuation of volunteer rescue workers famous for risking their lives to save the victims of Syrian government airstrikes, but for different reasons. About 100 members of the White Helmets, a volunteer relief group formally known as Syrian Civil Defense, along with their families, were evacuated to neighboring Jordan through Israel over the weekend. Raed Saleh, the group's director, said in an interview that 98 volunteers and 324 of their relatives made it out safely. Jordan's Foreign Ministry said they're expected to stay in Jordan for as long as three months until they're resettled in Britain, Germany and Canada. The operation to save members of the group and their families came amid fears that advancing Russian-backed Syrian forces were bent on exterminating the organization. President Bashar al-Assad's backers have sought to discredit the group by claiming it is a "false flag" operation of rebels whose widely distributed videos of government chemical weapons attacks are staged to discredit the regime. The involvement of Israel and Jordan illustrates how perilous the circumstances had become for the volunteers, who were hemmed in from one side by Syrian troops and from another by militants affiliated with the Islamic State group. Because Syria and Israel have officially been in a state of war since Israel was founded, there are no recognized border crossings between the countries, while Jordan closed its border to Syrian refugees two years ago after a car bomb killed seven Jordanian guards. It took appeals from the United States, Canada and members of the European Union to persuade Israel and Jordan to cooperate. Israeli Prime Minister Benjamin Netanyahu said Sunday that he decided to act after having been lobbied personally by President Donald Trump, Canadian Prime Minister Justin Trudeau "and others." As Syria's Russian-backed military swept through southwestern Syria, the volunteers had been trapped in a region near Israel that is believed to be one of the last remaining areas not under the control of forces loyal to Assad. Assad has been fighting a rebel insurrection since 2011, during which more than 400,000 people have been killed, Amnesty International estimates. The rest of the volunteers in the south couldn't be evacuated "because of the expansion of the regime's forces and the militias supporting them in all the region," Saleh said Monday. In a statement, Nikki Haley, the U.S. ambassador to the United Nations, hailed the U.N., Israel, Jordan, Britain, Canada and Germany for having helped to coordinate the weekend evacuation. "We couldn't be more thankful to the White Helmets for the bravery and selflessness they have shown, tirelessly risking their own lives to rescue and give medical care to victims of the brutal Assad regime," Haley said, sentiments that were echoed by the governments of other Western nations, reflecting the esteem in which the group is held. "The White Helmets have saved over 115,000 lives during the Syrian conflict, at great risk to their own," British Foreign Secretary Jeremy Hunt said in a statement, which said volunteers have been killed while "trying to rescue civilians trapped in bombarded buildings or providing first aid to injured civilians." 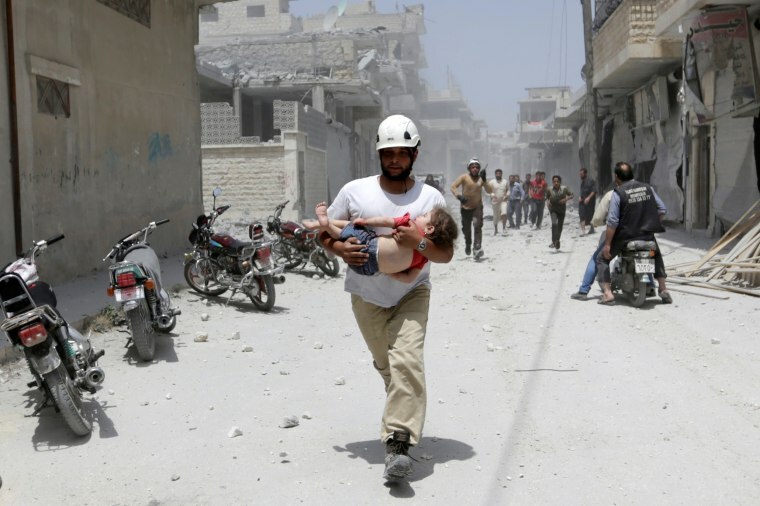 "We pay tribute to the brave and selfless work that White Helmets volunteers have done to save Syrians on all sides of the conflict," Hunt said. The group has been nominated for the Nobel Peace Price, and a sympathetic documentary, "The White Helmets," won the Academy Award for Best Short Subject last year. Another film, "Last Men in Aleppo," was nominated for this year's Best Documentary Feature Oscar. Assad and his Russian backers have accused the White Helmets of being a "false flag" operation of rebel fighters whose widely distributed videos of government chemical weapons attacks are staged to discredit Assad. The organization is regularly denounced in Russian media like RT, which calls its members "volunteers" in quotation marks and accused them in April of bribing "starving locals to act on camera in return for a loaf of bread." During evacuations of other opposition areas, nearly a dozen cases were documented of White Helmets volunteers being specifically targeted, pulled from buses, tortured and filmed making false confessions about being paid agents. Reacting to the evacuation on Monday, Russia's embassy in Israel sarcastically tweeted that it welcomed the departure of the "militants" because the prospect that "White Helmets will use chlorine in order to stage a chemical provocation in South-West Syria has decreased." The Syrian government, which has dismissed the White Helmets as terrorists, called the evacuation operation a "criminal process." The organization, which operates in rebel-held areas of Syria, was founded in 2013 by James Le Mesurier, a onetime British military officer who later worked for the United Nations and founded the Dutch nonprofit relief group Mayday Rescue. The United States continues to provide financial assistance for the volunteers. But in April, Defense Secretary Jim Mattis said the Defense Department was reducing the number of U.S. forces in Syria, and Trump pressed his national security team to end U.S. involvement in Syria as soon as possible — potentially leaving the White Helmets with no protection. "There is no doubt there was great danger to the volunteers," Saleh said Monday, adding that hundreds more volunteers in the south remain "in great danger" and that "we are trying to evacuate them." Meanwhile, "there are still 3,750 other volunteers working in Syria," he said. "We are still providing our services in Syria." Alex Johnson reported from Los Angeles and Charlene Gubash from Cairo.